I’m not sure what initially spurred my desire to learn to fly an airplane. I don’t even remember my first commercial airplane ride–I was young, though (we moved to Italy when I was five, so it was at least then if not earlier). My dad flew F-4s for the Air Force, so I heard about airplanes from him. I won a drawing for a free plane ride in a little four-seater when I was in middle school, which was a lot of fun. Until I had to move to the back so that my sister could sit up front. It’s much less fun in the back seat. 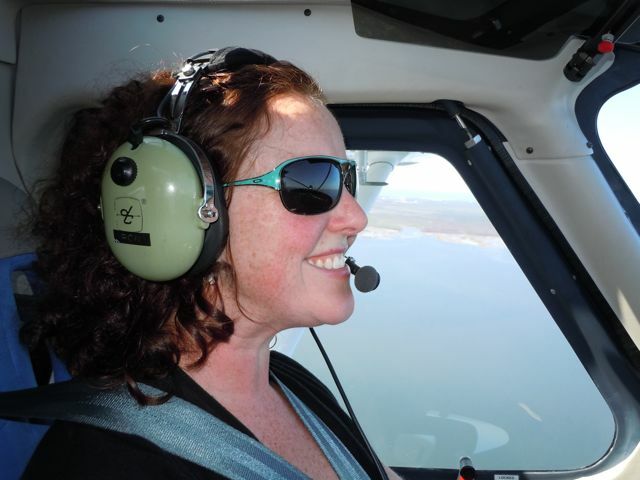 I saw my opportunity to learn more about flying from a deal on LivingSocial.com. 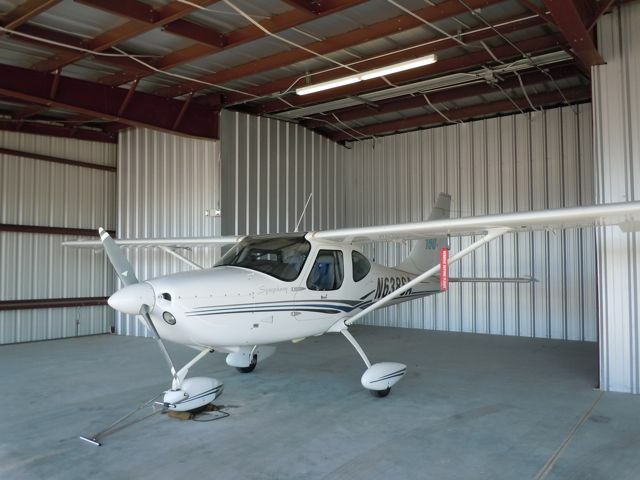 It was with Island Air Express in Panama City and consisted of: a flight lesson including 30 minutes each of ground instruction and flying time, an instructional booklet, a certificate, an aeronautical chart and an airport directory. Perfect! I bought the deal and called up the flight school to arrange the flying lesson for my birthday. Unfortunately, the instructor had to change the date when he got stuck in Amelia Island with a client, so it was rescheduled. I was excited, though–especially for the ground instruction. I know it seems nerdy, but I was excited to hear a bit more about the mechanics of lift, loft, wind speed, draft…technical terms like that. The Island Air Express office is at the new Panama City airport (ECP); the FBO (fixed-base operation) is next to the main terminal. My instructor, Ron, was running a bit late but we met up outside of the office and headed in. I was given an airport directory, an aeronautical chart of Florida and a instructional booklet. Ron spent most of the half-hour going over the aeronautical chart, detailing the various airports that I would be able to fly to (when I have my own plane, I’m assuming) and whether or not they have courtesy cars and other perks. The instructional booklet was saved for last–I could flip through that on my own. Apparently the instructions are just suggestions. No matter, though–I was ready to get into the air. We caught a ride over to the hangar where Ron keeps his single-engine, fixed-wing Symphony. After a pre-flight check of the flaps, wings, propeller and all sorts of other little pieces of the plane, we were almost ready to go. Ron removed the block from the front wheel and pulled the plane out of the hanger. It was a lot simpler than I imagined. Once the plane was out in the open, we climbed in and Ron instructed me to turn the key…and start the engine. A bit heady, that. There were all sorts of small things to do: adjust the flaps, call into the air traffic controller to let them know we were coming, figure out how to steer with the two pedals that I could barely reach, push in a device that seemed way too small to be a throttle and then we were moving. We taxied to the runway, got the okay from air traffic control and started down the tarmac. Ron talked me through the steps for accelerating and, it seemed like all of a sudden, we were airborne. We flew down towards the beach, got a bird’s eye view of Pier Park, turned left and traveled east along the beach. It was a clear, gorgeous day–seeing the beach from this angle was amazing. We saw a Navy training ship in off the coast and headed out over the water, practicing turns and maintaining altitude. Oh yeah–I was flying the plane this whole time. It seemed to go entirely too quickly. We turned north towards the Hathaway Bridge and flew back over the bay. We were given permission to land and lined-up on over our designated runway. The landing made me more nervous than the take-off, but Ron explained what to do, made a few adjustments and we bumped down without much of a hitch. It was a long landing, so we just coasted down the runway and turned back to parking lot at the FBO. I even managed to get us steered into the parking space indicated by the ground crew–without hitting the ground crew. It was such a cool experience. It wasn’t just the great view, but the knowledge that you could go anywhere that had a runway to land on…or a highway, if it came down to it. 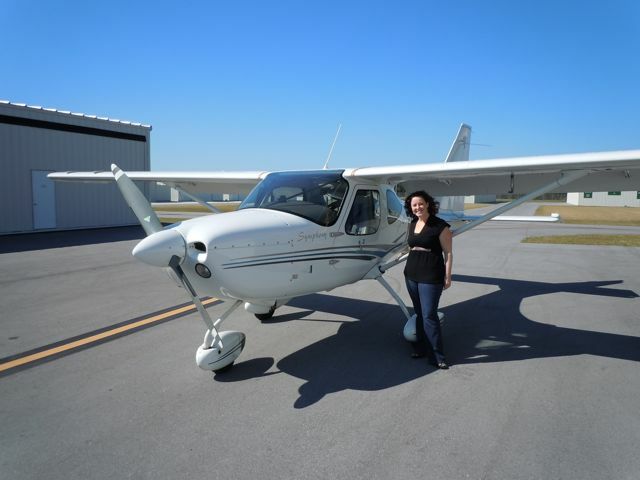 I would love to take additional lessons and build up enough flight time to get my private pilot license. It’s expensive though, so I might have to wait until I win the lottery for that particular goal. Why am I always attracted to the expensive hobbies? 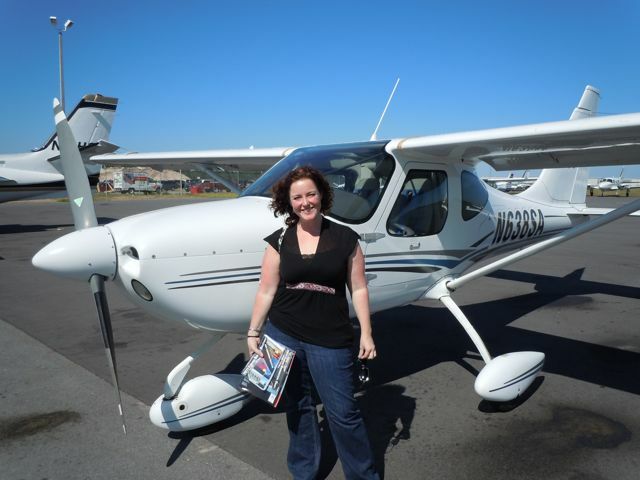 I would go flying again in a heartbeat–so if anyone has an private plane and they need a pilot, I’m your girl! Tags: fixed base operations, flying lessons, the list. Bookmark the permalink.